Grasshoppers can live as long as 7 weeks or perhaps 51 days as an adult. They have quite many predators in the wild. But these predators do not necessarily eat adult grasshoppers—they are mostly likely to prey on grasshopper eggs and hoppers. Adults have fairly longer lifespans precisely because they are comparatively less vulnerable to the potential predators. You may like to see more facts about grasshopper lifespan. How Long Do Grasshoppers Live? 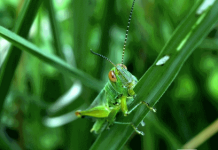 The lifespan of an adult grasshopper generally depends on their feeding behavior. If the grasshopper is a specialist feeder then it probably dies earlier than those that feed on a wide variety of plants. The reason why mixed feeders (polygynous) live longer than the specialist (monophagous) individuals is that the former seems to rely on numerous plants. The mixed-feeders can afford to leave those plants which are less nutritious and only eat nutrient-rich plants.